Separately, a program to educate credit union employees is expanding from four pilot states to an additional six and Washington, DC. And the American Nurses Association recently teamed up with a non-profit to train 10 nurses in five initial states to run workshops; to date, more than 700 nurses have gone through the financial workshops. More than half of Americans are not ready for retirement, according to the Center for Retirement Research, which sponsors this blog. And employees nearing retirement had accumulated just $78,000 in their 401(k)s in 2007, the latest federal data show. Mutual-fund buzz words and risk-return tradeoffs can intimidate employees, said Dennis Ackley, a long-time retirement consultant with Ackley Associates in Missouri. They’re unable to fend for themselves – so they don’t. The new programs aren’t focused on investments and instead teach basic budgets, insurance, saving, credit cards, and other financial matters. The assumption is employees need the big picture to understand why saving is critical to their retirement security. The Investor Protection Institute’s program for credit unions and other employers may be one of the largest such initiatives. It was funded by a 1993 settlement for financial wrongdoing between investment firms and state attorneys general around the country. Don Blandin, the institute’s president, said about 8,500 employees at 206 U.S. employers – mostly credit unions – have completed the courses; another 6,000 are enrolled in the spring round. 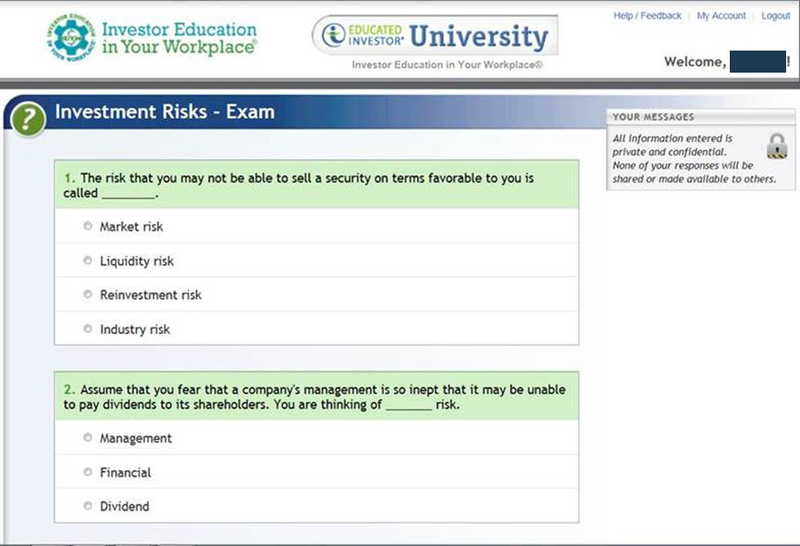 There is scant academic evidence that financial education is effective, and some credit union employees go the easy route, fellow employees said: they repeatedly retake the multiple-choice test at the end of each module until they pass. But employees who want to get something out of it did. Some 65 employees at the Local Government Federal Credit Union (LGFCU) in Raleigh, North Carolina, completed the series of 10 online teaching modules, about saving, investing, financial planning, retirement and other money matters, said Deborah Isenhour, senior vice president. Giving employees time during their workday to complete the online courses was key to high participation at LGFCU, said Isenhour. 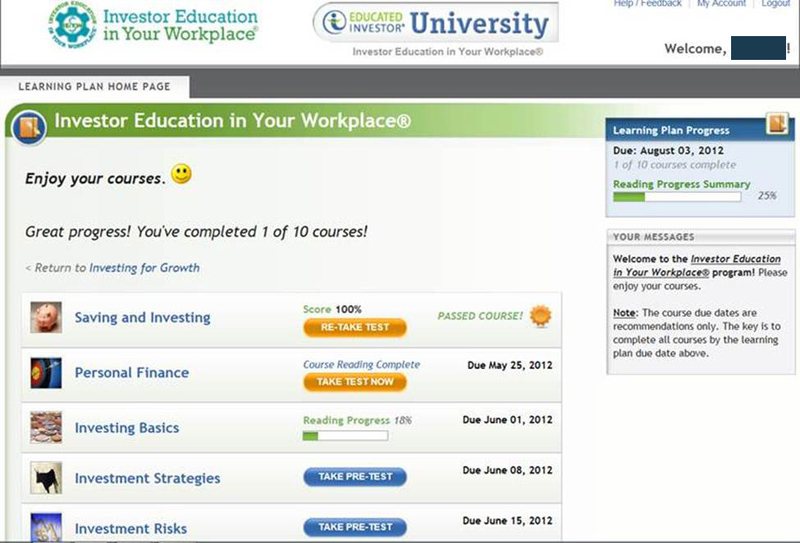 The credit union also recruited “ambassadors” to encourage coworkers to complete the courses. That maybe prove more effective than throwing the 401(k) materials on the kitchen table to deal with another day. I completely agree that there are not enough people saving for retirement. Some of the problem has to do with the fact that most small businesses do not even offer a 401(k) plan. Not only does more information need to be given to those that have a 401(k) option, but something needs to be put in place to make it more affordable for small businesses. There are other options and people should look at the benefits of annuities and other products, but most people won’t take the initiative. Without very extensive evidence-based and scientific study and testing any educational effort will not have testable results. We at retirementscholar.com are developing what we believe is the only evidence-based retirement financial education program available. And we have a lot of work to do as well. Thanks this is a useful article – hopefully employers continue to invest in educating their employees most of whom are (as noted) not nearly as prepared as they could be. Our take is that more automation will be required to meet the needs of the 75M baby boomers. We have been juggling some of our retirement right now. I think it would be easier to make decisions if more education was focused on by employers. At our company http://www.rodentguys.com/ we are too small for this. Bigger employers should consider this and may encourage more employee loyalty.